Go for stand out luxe with this gold-plated bracelet watch from Vivienne Westwood. Featuring a chic gold tone dial with classic logo branding and roman numerals, the crowning glory of this stylish timepiece is the gold plated bezel adorned with 'Vivienne Westwood London' in gold tone. 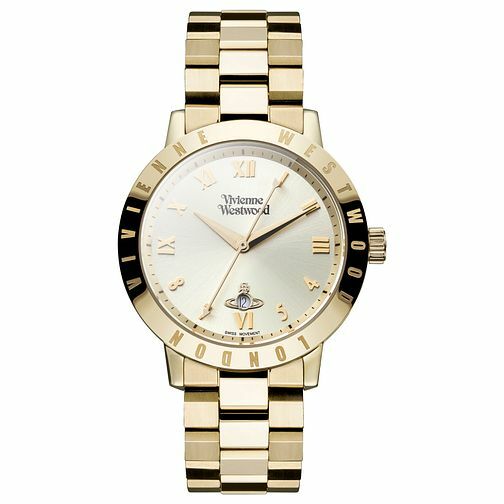 Vivienne Westwood Ladies' Gold Plated Bracelet Watch is rated 5.0 out of 5 by 1. Rated 5 out of 5 by Anonymous from Classy and understated I bought this watch along with another Vivienne Westwood watch. I couldn't decide between this or the other. I eventually chose the other one and managed to convince my sister to have this one as I didn't want return it - it is so classy and understated. The face is so simplistic but yet intricate. I also love how it has the date in the classic Vivienne Westwood logo. The watch is a Swiss movement so generally they last longer (I know this from working at a Jewellers). There is a nice weight to it as well. I prefer this Gold colour over the Rose Gold but this is my personal preference. Great buy and happy it stayed in the family!